⋅ Students hail from 43 states and 56 countries. ⋅ 20% identify as domestic students of color, and 15% are international. ⋅ 11:1 student-to-faculty ratio; 77% of classes have fewer than 20 students. ⋅ Over 80% of Wooster students receive need-based or merit aid. ⋅ Average award for students applying for financial aid is nearly $44,000. The College of Wooster is a community of independent minds, working together to prepare students to become leaders of character and influence in an interdependent global community. A private, independent, undergraduate college of the liberal arts and sciences, Wooster is nationally recognized for an innovative curriculum that emphasizes mentored independent learning. The College of Wooster’s 240-acre campus is located in a residential section of Wooster, Ohio (pop. 27,000), approximately 55 miles southwest of Cleveland, 80 miles northeast of Columbus, and 30 miles west of Akron and Canton. For the past 17 years, U.S. News & World Report has asked college presidents, provosts, and deans to nominate schools with outstanding undergraduate research opportunities and stellar senior capstone programs. Only two schools have been named to both lists all 17 years: The College of Wooster and Princeton University. Independent Study (I.S.) is the most distinctive feature of Wooster’s curriculum. For more than 70 years, I.S. has offered all Wooster students the opportunity to explore what interests them most and create an original research project, written work, performance, or exhibit of artwork, supported one-on-one by a faculty mentor. “College presidents and deans consider Wooster’s Independent Study one of the best senior capstone programs in the nation,” says U.S. News & World Report. Washington Post education reporter and columnist Jay Mathews ranks Wooster #4 on a list of America’s “outstanding but underappreciated” colleges in his book, Harvard Schmarvard: Getting Beyond the Ivy League to the College That Is Best for You. The city of Wooster is ranked in the top 50 (#37) of Best Places to Live in America by Money Magazine, making it the only college in Ohio in the top 50! 171 full-time faculty; 96% of full-time faculty hold the most advanced degree in their field. Over 55 academic programs and areas of study. In just the past three years, 38 articles co-authored by students and faculty members have been published in peer-reviewed journals. 95% of seniors are employed or in graduate school within six months of graduation. 99% of Wooster students live on campus. 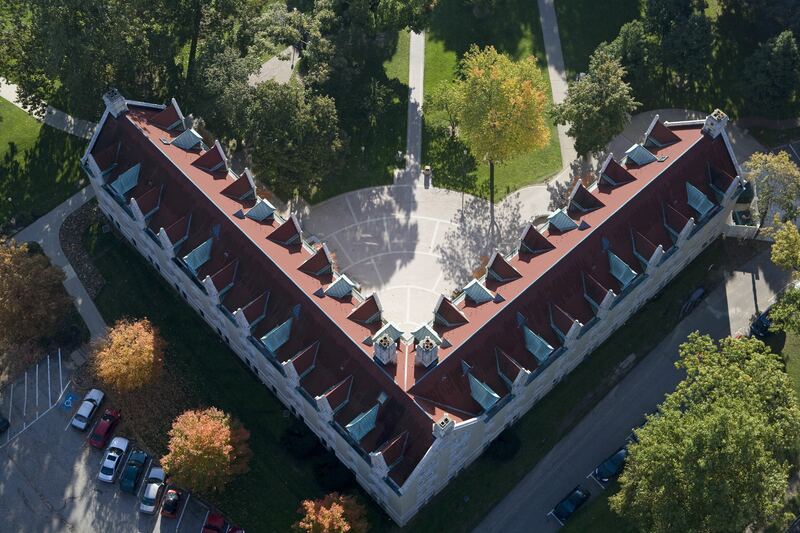 Students may choose to live in one of Wooster’s 15 residence halls, various suites and apartment-style residences, or one of 33 program houses. Students need not major or minor in music or theatre to participate in music ensembles, or win performing arts scholarships. 30% of Wooster students perform in at least one musical ensemble. 30% play on at least one of 23 Division III intercollegiate athletic teams. Over two thirds of Wooster students study off-campus, with programs available in over 60 countries. More than 95% of Wooster graduates are employed or in graduate school (or both) within six months of graduation. Wooster’s focus on mentored undergraduate research helps students develop independent judgment, creativity, project-management and time-management skills, self confidence, and strong written and oral communication skills: precisely the abilities prized by employers and graduate schools alike. That’s why Wooster’s alumni achieve distinction and success in a wide variety of fields. Learn more here.